Jesus cleansed the temple twice, but why did He do it? Jesus was angry on more than one occasion, and it wasn’t only at the Temple that He displayed godly, righteous indignation. He saw the religious Jews and their self-righteousness as hypocrites because they weren’t even taking care of their own elderly parents, so when Jesus saw how they had defiled the Temple, He was angry and had every right to be. It is not sin to be angry. God always has righteous indignation (Psalm 7:11), however “the anger of man does not produce the righteousness of God” (James 1:20). I can testify of that, but there may be a time when we’ll get angry about something and it’s not sin. The Apostle Paul says, “Be angry and do not sin; do not let the sun go down on your anger” (Eph 4:26), so some things should make us angry. Anger becomes sin when it lingers and when its pride centered (e.g. “Did you hear what they said about me?”). Things like abuse, neglect or taking advantage of the elderly, abusing children, and exploiting the poor should make all Christians angry, so it’s fine to be angry at something, particularly something that God is angry about. The difference is we don’t execute judgment and we’re told, “never avenge yourselves, but leave it to the wrath of God, for it is written, “Vengeance is mine, I will repay, says the Lord” (Rom 12:19). By the way, some pictures that show Christ using a whip on people and on animals in the Temple are inaccurate. Jesus would never do that. Instead He was running them out of the court because of what they were doing, and that was basically scamming the Jews who sincerely came to worship God. 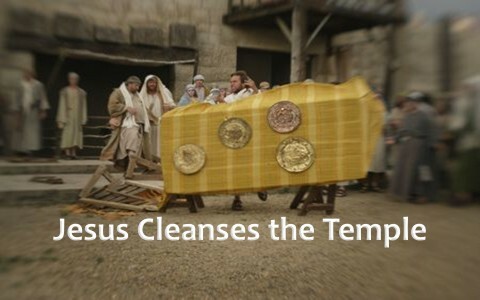 There were two occasions where Jesus cleansed the Temple. Once was shortly after He began His earthly ministry, and in fact, the Temple in ancient Israel had become defiled too, due to neglect of the Law of God, or Scripture. Uzziah’s pride caused him to act as a high priest at the Temple (2nd Chron 26:16). When King Hezekiah was cleansing and repairing the Temple, “The priests went into the inner part of the house of the Lord to cleanse it, and they brought out all the uncleanness that they found in the temple of the Lord into the court of the house of the Lord. And the Levites took it and carried it out to the brook Kidron” (2nd Chron 29:16), so Israel’s history of making the Temple a den of thieves is not new. Jeremiah the Prophet rebuked Judah and told them, “Has this house, which is called by my name, become a den of robbers in your eyes? Behold, I myself have seen it, declares the Lord” (Jer 7:11). I think that’s where Jesus quoted and the context is exactly the same with Israel. The first occasion for Jesus’ cleansing the Temple was when at “the temple he found those who were selling oxen and sheep and pigeons, and the money-changers sitting there” (John 2: 14), so after Jesus made “a whip of cords, he drove them all out of the temple, with the sheep and oxen. And he poured out the coins of the money-changers and overturned their tables” (John 2:14). The second occurrence, recorded in all three of the synoptic gospels (Matthew, Mark, and Luke), says, “And Jesus entered the temple and drove out all who sold and bought in the temple, and he overturned the tables of the money-changers and the seats of those who sold pigeons. He said to them, ‘It is written, My house shall be called a house of prayer, but you make it a den of robbers’” (Matt 21:11-13). On no occasions did Jesus ever use the whip on people or animals. The depiction of Jesus doing that in paintings is absolutely unbiblical. It often shows people cowering under Jesus’ whip, but that never happened! There is zero evidence of Jesus ever harming anyone because of His righteous anger. To have your mother or grandmother abused would be a case where Jesus is angry, but so should we. The difference is we inform the authorities and let them execute God’s judgment (Rom 13:1-5), so vengeance is from God (Rom 12:19). God is still cleansing the temple, but not the one in Jerusalem. That one’s totally destroyed. The temple I speak of (little “t”) is our own body in whom the Spirit of God dwells. The Apostle Paul makes a clear distinction between the actual, physical temple and the believer in Christ who is then a temple for the Holy Spirit to dwell in. Paul writes, “Or do you not know that your body is a temple of the Holy Spirit within you, whom you have from God? You are not your own, for you were bought with a price. So glorify God in your body” (2nd Cor 6:19-20). Just as in ancient Israel, they did not own the Temple, and neither do we. We were bought with the precious blood of the Lamb of God. It is to Him that we owe all. Let me remind you. There are only two temples out there today; temples for the evil one and temples for the Holy One. Jesus said you are either for Him or against Him (Matt 12:30). You cannot be neutral. To make no choice is to choose to reject Christ and “Anyone who does not have the Spirit of Christ does not belong to him” (Rom 8:9), so Paul wants us to “understand that no one speaking in the Spirit of God ever says “Jesus is accursed!” and no one can say “Jesus is Lord” except in the Holy Spirit” (1st Cor 12:3), but it is “the Spirit of truth, whom the world cannot receive, because it neither sees him nor knows him. You know him, for he dwells with you and will be in you” (John 14:17), therefore, strive to keep your temple clean because God dwells there…in you. Previous post: What Does It Mean To Fear The Lord? Next post: What Name Does God Give To The Wicked?